Orbiting so close to its star, at a distance of just 1.4 million miles, (GJ 1132b) is flooded with ultraviolet or UV light. UV light breaks apart water molecules into hydrogen and oxygen, both of which then can be lost into space. However, since hydrogen is lighter it escapes more readily, while oxygen lingers behind. A new study suggests that, contrary to prevailing wisdom, the temperature of a planet doesn't always stabilize over time, so hot-blooded worlds may have a hard time holding onto liquid water — even if they reside in the temperate region around their stars known as the "habitable zone." 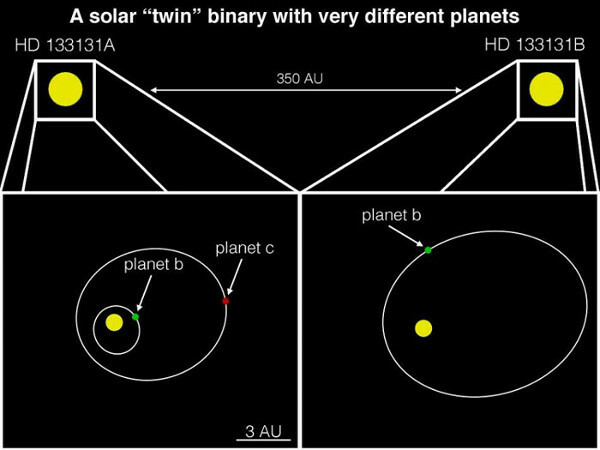 And this isn't just any old binary star system – these stars, called HD 133131A and HD 133131B, are the the closest-orbiting twin stars that scientists have ever found in a binary system where both the stars host planets. The pair lie within a dense cluster of stars that would normally be expected to strip objects away from one another. However, observations suggest that the two objects are so close that interactions with other stars would instead push them closer together, Gagliuffi said. Frustratingly this appears to be the ONLY article regarding this discovery and it doesn't mention which star, just that it's 65 light years away. "The ground-based observations suggested two possible scenarios for the three-body system: a Saturn-mass planet orbiting a close binary star pair or a Saturn-mass and an Earth-mass planet orbiting a single star… [T]he model with two stars and one planet is the only one consistent with the Hubble data. We were helped in the analysis by the almost perfect alignment of the foreground binary stars with the background star, which greatly magnified the light and allowed us to see the signal of the two stars." The planet orbits roughly 300 million miles from the stellar duo, about the distance from the asteroid belt to our sun. It completes an orbit around both stars roughly every seven years. The two red dwarf stars are a mere 7 million miles apart, or 14 times the diameter of the moon's orbit around Earth. If you wanna do the math and see how it works, visit Artifexian on YouTube. He has a great series of instructional videos. This video on p-type systems is relevant to Hubble's discovery. 1200 light years from Earth. JUST LOOK AT THAT PIXEL! Also the planet needs to be confirmed, so don't get excited. My question is, why does a planet need to be confirmed? Are there exoplanets who'd rather have a bar mitzvah? Out of the 144 hot Earths the team identified, they estimated that at least 24 of them orbit without another close planet, making them unique compared to multi-planet systems. Their finding suggests that at least 1 out of every 6 hot Earths have no nearby companion. In this case, 'nearby' means worlds with orbits "only a few times larger than the orbit of the hot Earth," Steffen said, which would translate to one or two months. Meet J1407b and its gigantic rings that orbit the "wrong way", as the New York Times's Nicholas St. Fleur puts it. Ice covered ocean worlds are probably seismically active. Measuring that activity can provide information about global and local habitability. This article examines the likely seismic activity of known and potential ocean worlds. We describe objectives and possible implementations for icy moon seismology. For currently known ocean worlds, we consider science objectives and technical challenges, and suggest priorities based on feasibility and potential science return. A seismic experiment could be less complex and less susceptible to noise than those implemented on Earth's Moon and planned for Mars. Such an investigation could probe the transport properties and radial structure of ocean worlds, yielding critical constraints on potential redox fluxes, and thus habitability. The winds on HD 189733b (which lies about 63 light-years from Earth, in the constellation Vulpecula) blow at up to 5,400 mph (8,700 km/h) — about seven times the speed of sound. And if that's not crazy enough for you, scientists think the rain on this world is made not of water, but of molten glass. The three Alpha Centauri stars get more and more interesting as we begin to discover planets around them, and the hope of finding planets in the habitable zone around Centauri A or B continues to drive research. Alpha Centauri could be thought of as a close binary with a distant companion, since we’re still not absolutely sure whether Proxima Centauri is gravitationally bound to the system. Learning more about binary systems, in any case, is interesting in itself but also may open windows into our nearest stellar neighbors. CHARIS will be available for use in February 2017. K2-60b is a sub-Jovian exoworld with a radius of about 0.68 Jupiter radii and 58 percent less massive than our solar system’s biggest planet. EPIC 216468514b has a radius 44 percent larger than Jupiter’s and a mass of 0.84 Jupiter masses. What is noteworthy, both planets have short orbital periods - 3 and 3.31 days respectively. What effect does the composition of a star have on the planets that form around it? However, after extensive deliberation, the Committee decided to annul the vote for one particular ExoWorld — tau Boötis — as the winning name was judged not to conform with the IAU rules for naming exoplanets. To this end, the IAU will organise a new contest to decide the name of tau Boötis in the future. Aw nuts, I thought it was going to be something fun like "Planet McPlanetpants" or something. The new vortex results are presented in two papers, both published in the January 2017 issue of The Astronomical Journal. One study, led by Gene Serabyn of JPL, the overall lead of the Keck vortex project, presents the first direct image of the brown dwarf called HIP 79124 B. This brown dwarf is located 23 astronomical units from a star in a nearby star-forming region called Scorpius-Centaurus (an astronomical unit is the distance between our sun and Earth). One of the exoplanets was a hot "super-Earth" that has a rocky surface and is found in the fourth nearest star system to our own. That planet, known as Gliese 411-b, could suggest that all the stars near our own sun have planets orbiting them – and as such that those too might be like Earth and have the conditions for supporting alien life.